Great price and awesome pillows! Enjoy a blissful night of rest with these 300-thread count medium-density pillows. Filled with Primaloft Thermo, a luxury down alternative, these pillows are a great hypoallergenic choice for a good night's sleep. The self-piping edges add style while being machine washable adds convenience. I spent an exhausting search for Primaloft pillows to replace the ones I had enjoyed for years. These from O.co are indeed, Primaloft. The only reason I gave them four stars is that we have no option to choose between firmness levels. I ordered two in Standard size and two in the King size. Even though the tag on each size states, "Primaloft-Support" the pillows are vastly different. The Standard sizes are very soft and comfortable, but not so soft that they feel flat. The King size are very firm - too firm to be comfortable. They don't seem to flatten at all when you lay on them so you're kind of propped up. They're great for leaning back on and reading in bed, but way to ofirm to sleep on. I kept all these pillows because the price was right. If the King size had been the firmness of the Standard I would have given them five stars. Sleep Better with Good Pillows! My husband and I were recently on vacation in Miami. We both agreed our suite at the FountaineBleau had the best pillows we had ever slept on. I checked the tags and they were PrimaLoft so I was thrilled to find them on Overstock for a price I found reasonable. I can't believe we used our old, uncomfortable pillows for so long. These PrimaLoft pillows are fantastic and have improved our sleep. After a vacation in Turks & Caicos and surprised with the pillow quality, I launched my quest for the PrimaLoft pillow. Many sites offer the product but I discovered O.Com provided the best price! It took some research to reach my comfort level and pull the purchase trigger, but I'm thrilled I did. The pillows are indeed PrimaLoft brand pillows (Downlite Company) as evidenced by the shipping package and label on the pillow. The pillows have provided relief from neck discomfort and incessant toss and turn throughout the night. I daresay my husband is snoring less. Put two on your side and it's as though you are enveloped in a cushion. I recommend these pillows to you and if you are shopper would loves a bargain by eliminating the expensive packaging offered by other sites / vendors....buy from O.Com. Seems the display photos from competitive sites package the pillow in the extravagant, zipper, heavy duty plastic bags we either dispose of or use for blanket storage. I have enough storage containers and opted to save over $200.00 + dollars by purchasing 2 sets of this twin pack from O.Com. Happy sleeping! I like these pillows AND they still stay too hot! But fear not, they keep their shape, and would be fantastic if they were cooler. The fabric on the pillows are top quality, and for the price are a good solid buy. If you have severe neck problems, (and I do), this pillow is good with a flat topper (an older pillow to adjust for height). Just note, was a little disappointed that it wasn't cooler. This being said, I have hit the age where coolness has become a factor in life! The people at Overstock cannot be praised high enough.. Another pillow I bought around the same time was a bust. They cheerfully refunded the money the next day I tried it. I am mentioning this because usually pillows are a 'no return' item in stores. I am most impressed that they would take it back, because there is high risk in pillow ordering. I want you all to feel at ease in trying the pillows here, knowing you can return them if they don't fit your needs. This being said, these are keepers! Great price for great pillows! The pillows are comfortable and lofty, but they are definitely a medium density. I was looking for something between medium and firm, so initially I was disappointed, but they have turned out to be quite comfortable. 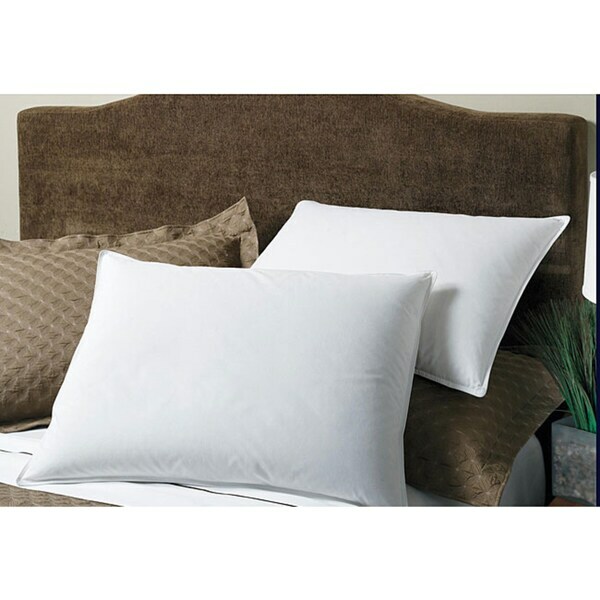 Hypoallergenic primaloft pillows at a great price. Have had them only for a short time but are happy with them so far. No complaints and no stiff necks! Yea!! Thanks Overstock! I purchased these because it was a recommended hypoallergenic pillow. But they are really just too soft for side or back sleeper so I will have to return. Not a lot of fill in pillows, very soft. Would have preferred something firmer with more fullness. Pillows are amazing! So comfortable that I can't wait to lay my head on them at night. Great pillows. So far they have remained fluffy and I have been able to wash and dry them with out a problem. I use a tennis 🎾 ball when I dry pillows. I purchased four and I am happy with my purchase. Large and comfortable. Very good pillows for the price. very soft and comfortable...a little softer than i anticipated, but i still like them. if you are looking for a firm-ish pillow then these aren't for you, but if you like really soft and fluffy then these are the pillows for you. These pillows fluffed up nicely and hold their shape. They are soft and comfortable, I have them inside pillow shams and they have held up well. I was looking for soft ... but not too soft pillows. These fit my wants ... material soft but not flimsy. Totally satisfied and prompt delivery. Purchased these for the guest room as part of a renovation in 2015 and got new bedding throughout. They are cloud soft and fluffy, but still supportive. Recently brought them in our room following a surgery, for extras to prop up various body parts, haha. Loved them so much, are ordering some for the master. Check that review when it happens for an update on the product 3+ years later. Extremely comfortable and they hold their shape. Highly recommend. Not to happy with these. I went by the reviews because I would not have paid so much for a pillow that is already flat. Not had them a month. Very soft and ideal for snuggling while side/stomach sleeping. Also has a firmness but enough give for your head of back sleeping. You can kinda mush the pillow around under your head without raising your head too high if you are a stomach or side sleeper. Read the reviews and they sounded great. I also love hotels pillows and always wonder what kind they were.